Charlie Engle is not like most people. For one thing, he’s run across the Sahara Desert — a feat that turned into a documentary narrated by none other than Matt Damon. He’s “summited ice-covered volcanoes, swam with crocodiles, and served a stint in federal prison.” Making the North Carolina-based writer and ultramarathon runner’s story even more improbable is that he’s accomplished everything after overcoming a life-threatening drug and alcohol addiction. Engle had always been an athlete. After running a five-minute mile in Grade 8, he went on to star in six sports throughout high school. It was only after starting university at North Carolina that he discovered another, more destructive talent. What started with alcohol turned to cocaine — which, in the United States of the 1980s, came to define an era of drug use. The tipping point, he says, came in July of 1992 after the birth of his firstborn son. Vowing to get clean, he nonetheless ended up on a lengthy crack cocaine binge in Wichita, Kansas, during which his car ended up littered with bullet holes that were intended for him. Newly sober, Engle turned to the one thing that made him feel alive: running. 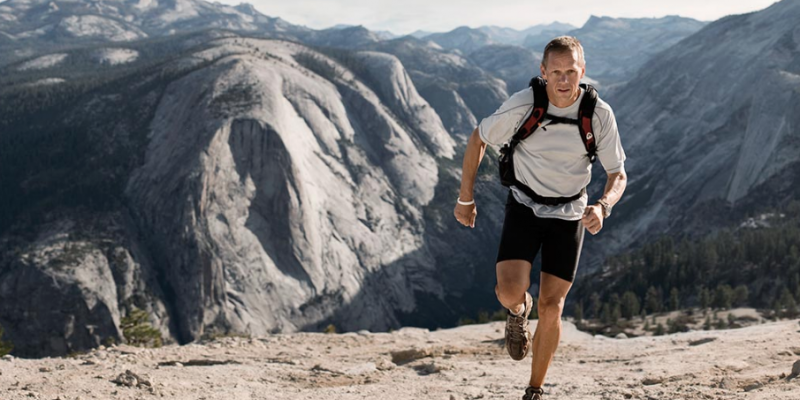 He started entering marathons, and then ultramarathons — running through jungles, over mountains, and in races around the world. One day, a friend — Canadian Ray Zahab — floated the idea of running across the Sahara. Joined by Kevin Lin, another ultramarathon runner from Taiwan, the two embarked on the challenge in November of 2006, running through six countries and nearly 7,000 kilometres from Senegal to Egypt. Engle partnered with narrator Damon to create H20 Africa — an initiative which has since become Water.org — with the goal of bringing clean water to communities along the Sahara route. Now 25 years sober and a motivational speaker, Engle has turned his life’s story into the memoir Running Man. The story captures Engle’s peaks and valleys, from the depths of addiction, to the vastness of the Sahara, to his time behind prison bars. “I would never want to lose the addict part of me, because it’s all the best parts of me,” says Engle.